Eddie Gibbons was born in Liverpool and now lives in Aberdeen. 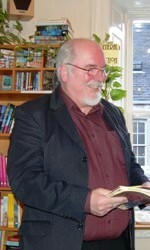 His first two poetry books, Stations of the Heart and The Republic of Ted, were published by Thirsty Books, Edinburgh. His poems appear in two further books: Three Way Street and Zugzwang, published by Koo Press, Aberdeen. In June 2004 he appeared at the Bloomsbury Theatre, London, alongside John Hegley and Michael Donaghy, amongst others. He performed at the Thirsty Lunch programme during the Edinburgh Festival Fringe in August 2004. Gave readings in Dortmund and Berlin in April 2005 by invitation of the British Council, along with other Thirsty Books authors. Was guest reader for Lola's Hour on ME FM (Multi-Ethnic) Radio, Aberdeen, May 2005. An audio interview with Eddie Gibbons, whose book of football poetry Game On! was published in 2006, appears on Textualities.